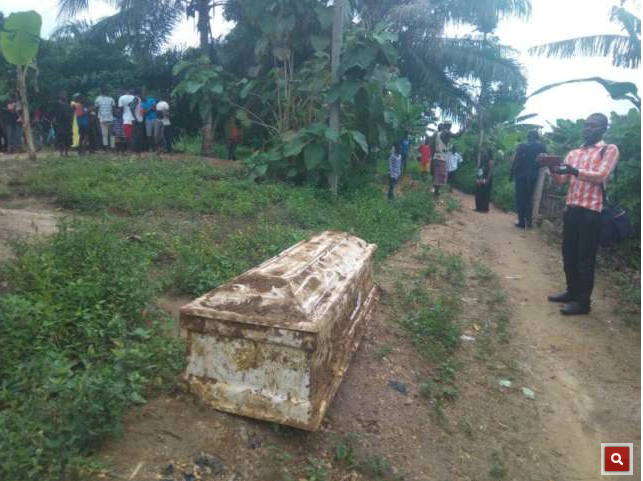 The chief of Assin Dansame in the Central Region of Ghana has ordered for the body of a native of the town to be exhumed few hours after he was buried. According to the chief the deceased; Koo Emma never participated in communal labour hence his order for the remains to be exhumed. He said that he had warned Koo Emma several times when he was alive and also told him he (the chief) will not allow for him to be buried in the community when he dies. Nana Twum Barimah V said he needed to carry out the threat to serve as a deterrent to other residents who may want to emulate Koo Emma. On Monday, 26 June 2017 the corpse was exhumed upon the orders of the chief, Nana Twum Barimah V.
This got the family members of Koo Emma angry.